Shanah Tovah – Happy New Year! Rosh Hashanah, the Jewish New Year, is always celebrated with a special meal of symbolic foods – especially those emphasizing the sweetness of the new year, traditionally represented by apples and honey. Every year though, we try to find some non-traditional Rosh Hashanah foods from around the world to spice things up a bit. Serious Eats has three international menus from Forward featuring Rosh Hashanah foods from Iran, Turkey and India. Some highlights include Turkish pumpkin bread, Persian chickpea cakes, and Indian Lamb Biryani (seen above). We were also intrigued by the Chicago Tribune’s recipe for Moroccan Chicken. If you are still looking for more sweet treats, Serious Eats has 18 modern takes on Rosh Hashanah dessert favorites. In any case, you can never go wrong with a little babka. Sometimes it’s hard to know which type of cuisine to choose when deciding on a restaurant, especially when traveling in a city with as many great options as Washington DC. 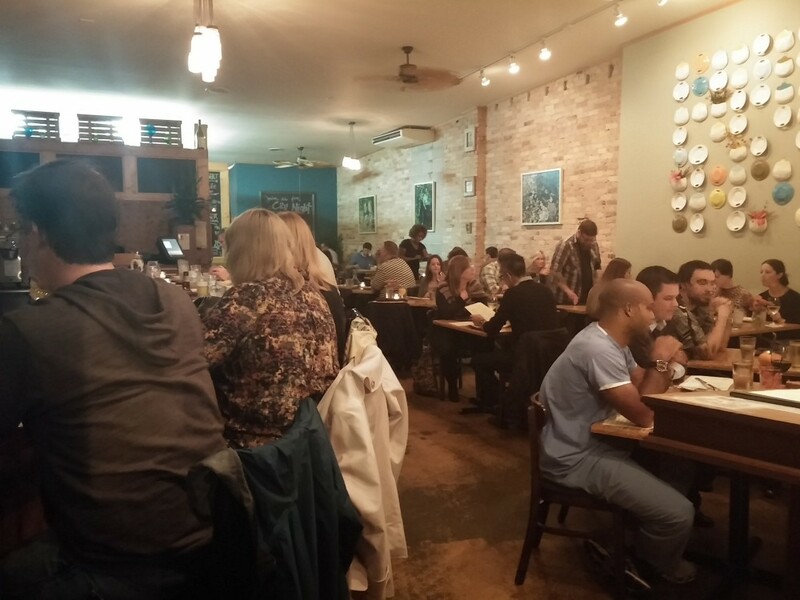 When we were in DC we found some great restaurants from various countries, but we also found a great one that covers a bit more ground: Compass Rose (1346 T Street NW, Washington, DC 20009) in Washington DC. Compass Rose is a globetrotting restaurant with a little bit of food from a bunch of various countries. According to Compass Rose, “So while it’s great to travel around the world, we understand that’s not always possible; instead of waiting for the smells and tastes on a great trip, we’ll bring them to you—in a cozy row home right in your own neighborhood.” Each dish at Compass Rose is listed alongside its country of origin, and the selections rotate frequently, and span the globe. Some examples off the menu when we visited include arepas from Venezuela, bhel puri chaat (kale, puffed rice, potato and tomato) from India, anticuchos from Peru and lamb kefta from Lebanon. When we saw that they had one of our Brazilian favorites, shrimp moqueca, we knew we had to visit. It can get pretty crowded, and there are no reservations, we made a point to stop in early. The atmosphere at Compass Rose is pretty romantic: with low lights and wooden tables in a few connected rooms. There is also a special secret room in the back for people ordering the set menu (which is by reservation), when we visited it was a Bedouin Tent theme, with a selection of North African dishes. The international theme even goes to the cocktail and wine list, which spans less commonly-known wine regions like Lebanon and Hungary. Camarão na Moranga (Brazil) – shrimp curry with coconut milk and dendê oil (Palm oil), served inside a small acorn squash. This seemed like a riff on the Northeastern Brazilian dish moqueca – shrimp in a creamy sauce – and is what initially drew us to Compass Rose. Happily, this was probably our favorite dish of the night. 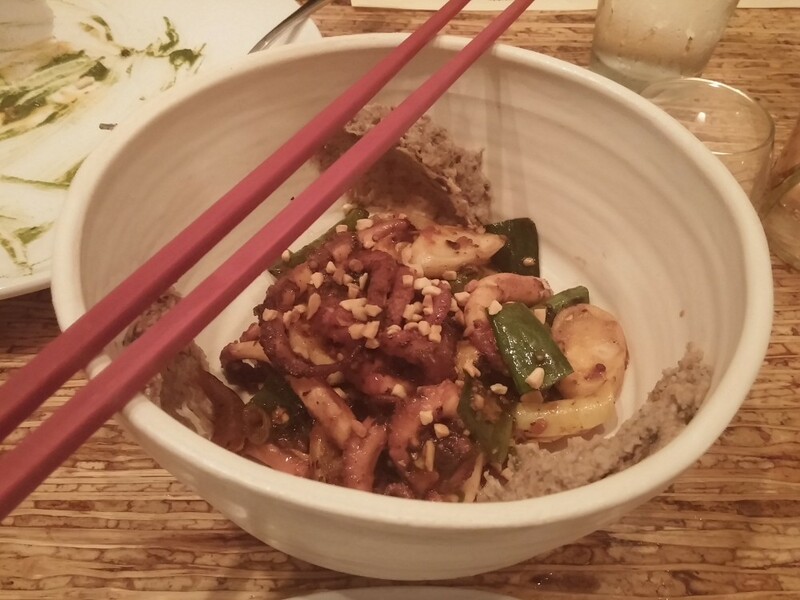 We have never had a moqueca served inside anything but a bowl – and the squash bowl was a great addition. Smørrebrød (Denmark – above) – house-cured trout, with trout roe and edible flowers. The presentation of this dish was amazing, and we were very impressed by the house-cured fish, giving us a real taste of Scandinavia. Grilled Calamari (Greece – below) – served over red quinoa, with toasted pistachio & feta cheese salad, and doused with lemon and oregano. We were surprised how big this dish was! The calamari was deliciously tender, with an acidic punch and without chewiness. Kogi Ribs (Korea) – Berkshire pork with a sweet-hot honey-ginger scallion marinade. The ribs were delectable, and had a great touch of sweetness along with a little bit of spice. For dessert we got Crema Catalana (Spain) – A Spanish version of creme brulee. This dessert was tasty, with a hint of vanilla, but we were sad that it was so small! 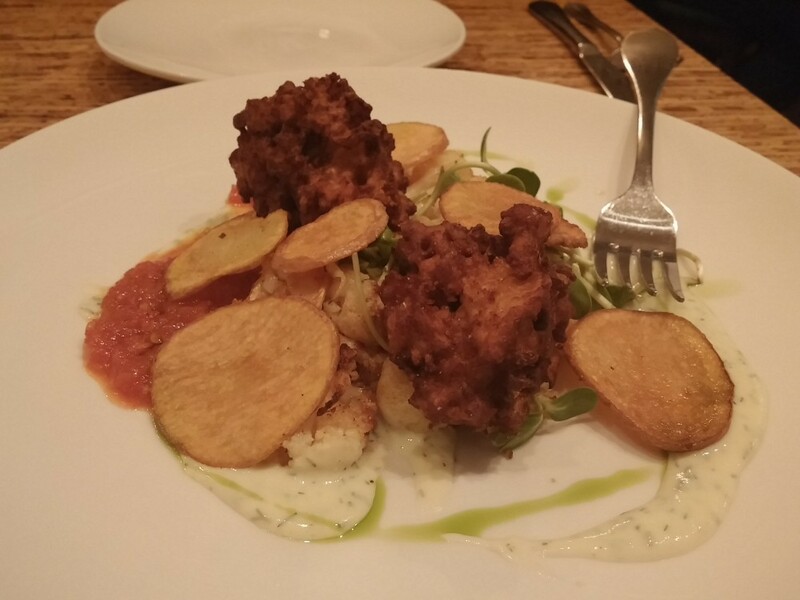 Everything we sampled at Compass Rose was delicious, with fresh ingredients and clean flavors. If we went back, we would also order the Georgian flatbread – Khachapuri – with cheese, egg and butter. We saw a few being served at tables all around us, and it looked beyond delicious! Compass Rose is the perfect place to temporarily cure your wanderlust, we really liked everything we tried. Whether you are feeling like Spanish or Korean, Compass Rose will have something for everyone in your dining party. After our delicious dinner at Odd Duck in Milwaukee, we were inspired to try some of the eclectic small plates in our neck of the woods. We had heard great things about Ada Street (1664 N. Ada Street, Chicago), and Chef Zoë Schor’s creative dishes, so we wanted to try it out with our foodie friends D & B. We went relatively early, and were able to snag a table, without much advance notice. Like Odd Duck, the menu was divided into sections that helped describe the food by category: “Pick it Up,” “With Toast,” “Forks, spoons & knives” and dessert. The dishes range in size, and all are meant to share. There is something for those that are gluten free, too, which we always appreciate. The room was a large and cool and there were giant garage door windows that could open up to reveal a large patio area. There was even a record player tucked in the corner, which we definitely liked. We definitely appreciate the boom in casual but high-quality farm to table restaurants in the Midwest. We heard nothing but praise for one of these restaurants, Odd Duck (2352 S Kinnickinnic Ave, Milwaukee, WI), so we were incredibly excited to try it. 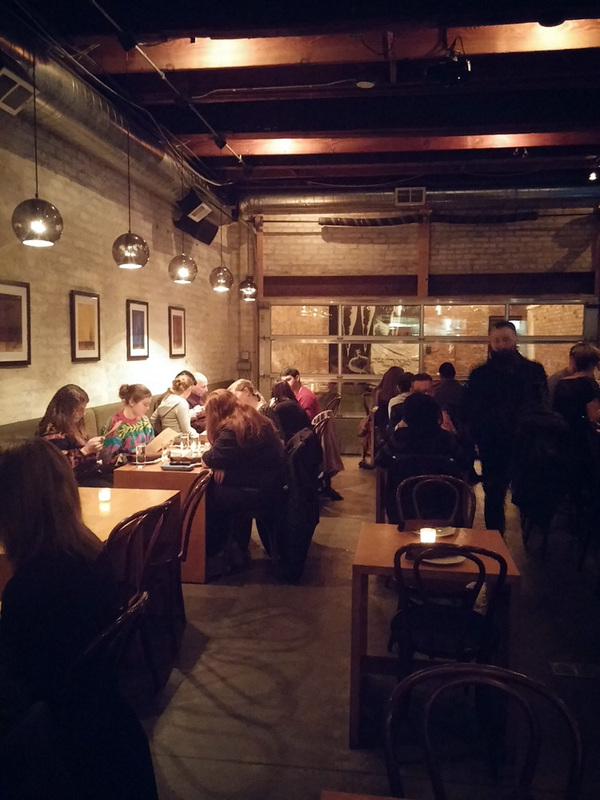 Inside Odd Duck is a cool space, with exposed brick and pottery on the walls, buzzing, casual and friendly. The menu at Odd Duck is both locally sourced and globally inspired – a combination of two of our favorite restaurant concepts. You can find dishes spanning every continent, divided into two halves of small plate dishes: vegetarian and meat. When we visited there were 12 dishes in each half, and our server assured us that the selection changed daily. We decided to go for our server’s suggestion of at least 2 dishes apiece, and we tacked on one to share (though all of the dishes are meant to share….and we did end up sharing all of them). We had a hard time deciding what we wanted, but tried to do a sampling of both the veg and meat options. Along with the list of small plates you can also order individual portions of cheese and charcuterie including both local (Smoking Goose Meatery, Hook’s Cheddar) and global selections (Jamon Iberico). Brazilian cheese bread with watercress and Kolrahbi, yogurt with spinach puree. ($8) This was the first dish out of the gate. Being purveyors of Pão de Queijo, I think we were expecting too much with this one. This was a chewy, slightly tangy bread roll, but did not taste like a Pão de Queijo at all and the texture was a bit off. However, had we not had actual PDQ from Brazil as a cultural reference, we probably would have liked it much more. Vietnamese fried trout topped with an herb salad, over glass noodles with a delicious peanut lime and chili sauce ($10) This was a real standout dish. The fried trout was delicate, and not greasy at all. It also contained one of our favorite food combinations: peanuts and lime, so how can you go too wrong?The sauce was strong and aromatic, without being overpowering, and there was a little kick. Charred octopus with black beans and rice cake, oyster mushrooms and scallions ($10) M really liked this one, and even for those among us who are not big fans are octopus, this was a standout dish. The octopus was tender and crispy – not chewy at all. Braised beef shortribs stroganoff with potato gnocchi and mustard greens ($12). 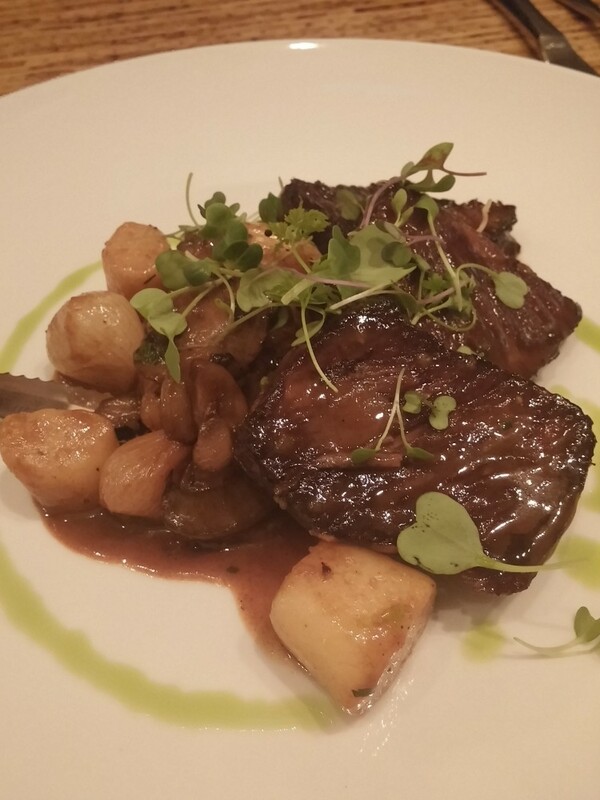 This was a classic, hearty dish, with fork-tender shortribs. We appreciated the update of the classic Midwest dish, and the gnocchi were light and tender. We really enjoyed the food at Odd Duck. The vibe was good, the menu was interesting and the price is right. We wish there were more of these types of places in Chicago (especially at this price point). We can’t wait to go back to see what is on the menu next time! We have come across recipes calling for something called “Maggi” or “Maggi Seasoning” in Latin American, Asian and European recipes alike, and it had always wondered about this mystery ingredient. So what IS Maggi?! Turns out Maggi seasoning is a thin, salty and savory sauce somewhat like soy sauce. Also like soy sauce, the role of Maggi is to give a savory umami kick to any dish. We were incredibly interested to learn that Maggi was originally a Swiss product, and was created in 1872. Maggi is now a huge international brand name which was bought in the 1940s by Nestle, and hosts a ton of other products like bouillon cubes, ramen and sauces under its banner. However, the most famous Maggi product is probably still the seasoning sauce, Maggi-Würze. You can find Maggi in a diverse array of stores given its international popularity and we have seen it in German, Chinese, Mexican and Russian food stores (the formulations may also vary by country). So what do you do with Maggi? How about make a quick Vietnamese steak, Indian-style noodles, Malaysian black pepper chicken or a Mexican michelada. I recently stumbled across the James Beard Award-winning Perennial Plate, an excellent blog and video series which is self-described as “dedicated to socially responsible and adventurous eating.” Though the series started in Minnesota, they have now gone worldwide and feature videos about food and food culture from around the world: Japan to Ethiopia and beyond. Check out all of the Perennial Plate videos on Vimeo. It is hard to pick out just one to highlight! To keep with the theme of winnowing down, below is a video that is “Two weeks in Morocco boiled down to three minutes.” Having spent a little time in Morocco, this certainly captures the feeling of sensory overload. I’m definitely going to be catching up on this backlog of videos ASAP! We wrote a little bit earlier about 538 Blog’s International Food Association World Cup, where users could vote for their favorite national cuisines. While the World Cup of Futebol has been over for a while, the Food Cup just ended. The four teams making it into the semi-finals were Italy, USA, Thailand and Mexico, which seems like a pretty solid match-up. The final round was between the USA and Italy, and Italy eventually prevailed. Not too surprised with the result – who doesn’t love Italian food? We polled 1,373 Americans through SurveyMonkey Audience and asked them to rate the national cuisines of the 32 teams that qualified for the World Cup, as well as eight additional nations with bad soccer but great food: China, Cuba, Ethiopia, India, Ireland, Thailand, Turkey and Vietnam. So who’s going on to the Round of 16? Personally we think the list is pretty decent, though we’d have picked Turkey over Germany. Acai at Tacaca do Norte – a taste of Brazil! Getting ready for the Copa do Mundo / World Cup! The World Cup is almost here! In honor of this global event, we are looking forward to cheering on the Brazil and US teams and sharing some of our favorite stories and dishes from around the globe. Also look for special coverage about the food scene in Brazil, we still have a lot to cover from our time there! The World Cup is only just a few days away. Of course, we will use this global event as yet another way to highlight some of the lesser-known and more delicious foods from all around the globe. For a first little taste, why not check out Bon Appetit’s list of top sausages from every country represented in the cup, from Croatia’s ćevapi to Mexico’s chorizo to Algeria’s merguez! San Pellegrino and Restaurant Magazine’s 12th annual list of the the world’s top 50 restaurants has been released. The number one restaurant is Noma, the Copahagen restaurant helmed by Rene Redzepi, of the Nordic Food Lab. We are happy that there is a Chicago restaurant (Alinea) and a São Paulo restaurant (D.O.M.) in the top 10!